I haven’t been blogging much lately. Too much life getting in the way. Too many things that just haven’t gone right. Too many things that have just been… complicated. I wish sometimes that things could just be easy. Easy to get done. Easy to go through. Easy to figure out. But that’s not how life is, in general. And when things get difficult and complicated even The Humble Food Snob tries to find things that are as UNcomplicated as possible. Sometimes that even means throwing together a dish that is made up of simple, premade products that maybe aren’t the greatest for you, but provide a measure of comfort that at least partly makes up for some of the dubious ingredients. Sometimes you just need that. One example is my taco bake. 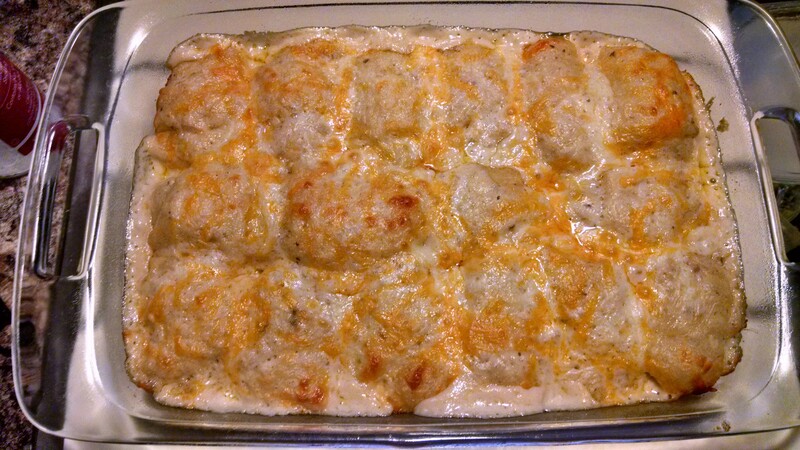 Another is this casserole. I found it on a now-defunct blog and played with the recipe until it came out just right. My daughters were reluctant to try it, since it’s not exactly beautiful food, but once they did they loved it! They even like to take it to school for lunch. And now that winter has come to South Dakota I’m looking for hot foods to send with them for lunch. They have recess before lunch (which I think makes more sense than sending kids out to run around on a full stomach) so they need something to warm them up for lunch. This casserole is just the ticket! And it’s easy enough to just throw together; even when life is being frustratingly difficult. The yellow stuff in the cup is canned nacho cheese sauce. I haven’t found a recipe I like for homemade yet, so I use canned. You can also use the salsa con queso that’s found in the chip aisle. All you need is about a quarter cup. You can leave it out, but I like the flavor and moisture it adds to the filling. 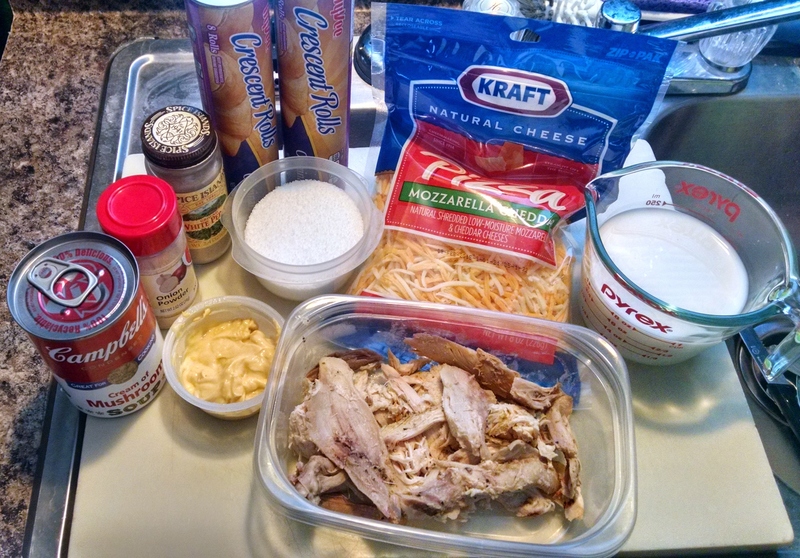 So chop the chicken, mix in the cheese sauce if you’re using it, and add half a cup of the shredded cheese. Next, pour the remaining sauce all over the parcels and then sprinkle the remaining cheese over the whole thing. Cover this with foil that you’ve sprayed with oil or cooking spray (it’s the easiest way to make sure that what you’re baking doesn’t stick to the foil) and put in your preheated oven. Bake for about half an hour, then remove the foil and return the pan to the oven. Bake another 10-15 minutes or until the rolls are cooked and the sauce is bubbly. That looks SO good! I wish I was eating it right now, but even the leftovers are long gone. The girls took them for their school lunch. It’s the perfect meal for when you need good food that’s easy to make! Add a salad or crunchy baby carrots- or even some canned mandarin oranges and you’ve got a simple meal that’s very tasty and satisfying. And, best of all, it’s just plain EASY! *Grease a 13×9 baking dish. *In a small sauce pan, combine the soup, milk, onion powder, salt, and pepper. *Bring to a boil over medium heat, then turn the heat to as low as you can get it. *Add in one cup of the cheese and stir to melt. 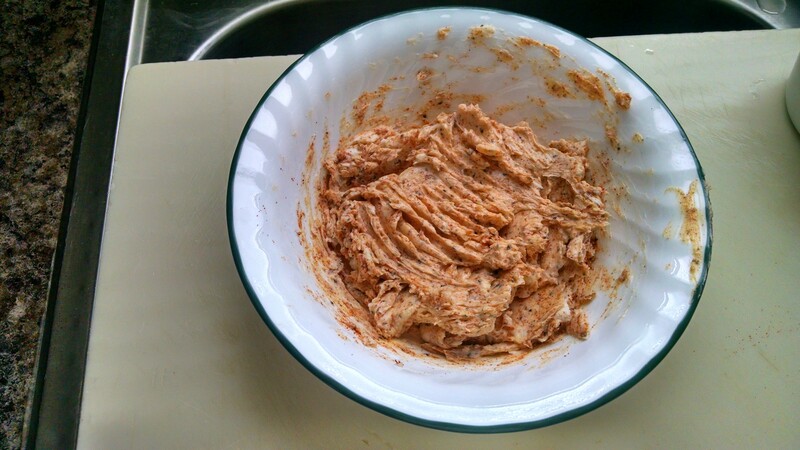 *Spread a scant half cup of sauce on the bottom of the baking dish. *Leave the rest of the sauce on very low heat. 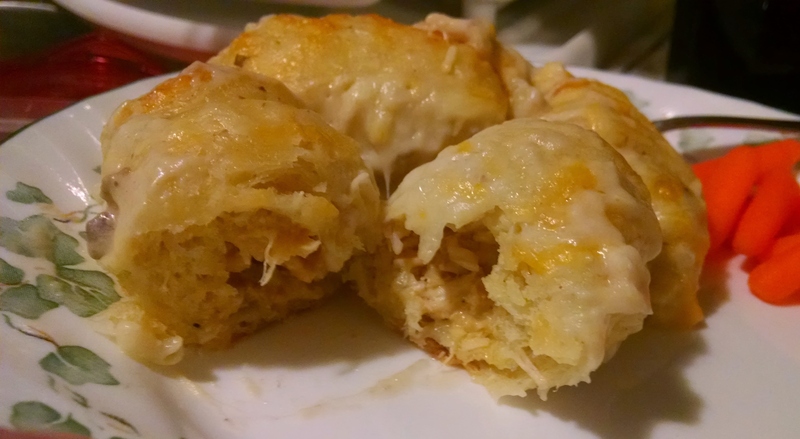 *Combine the chicken, cheese sauce, and 1/2 cup of the cheese. *Open and separate the crescent rolls. You can put out as many as you have room for on your clean work surface. *Press the rolls gently to flatten slightly. Don’t mash them. *Place about 1 tablespoon on the bottom of the wide part of the crescent. 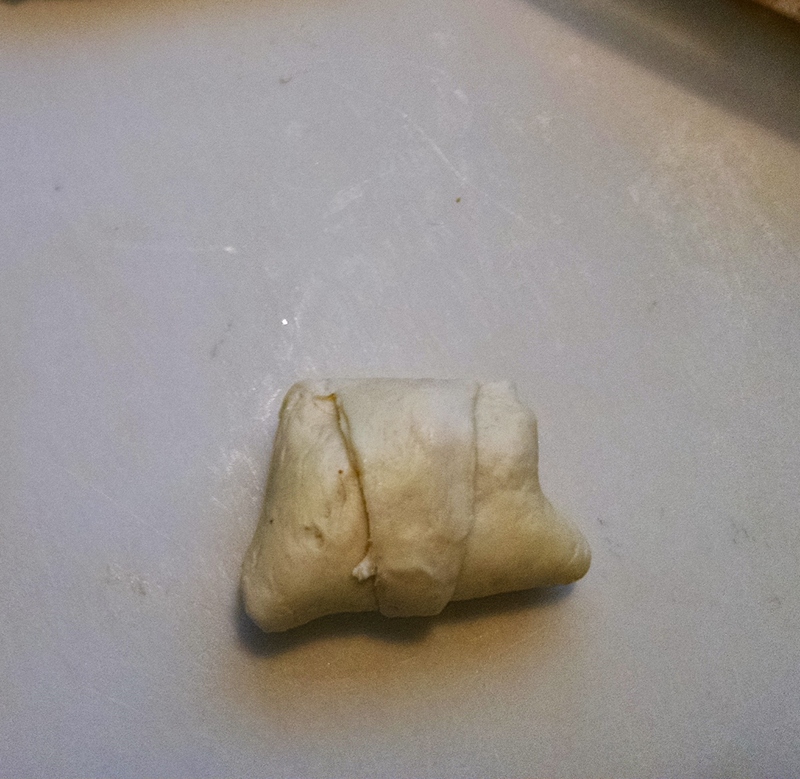 *Fold the two bottom corners up and over the filling. *Roll the crescent up, from bottom to top, as shown above. 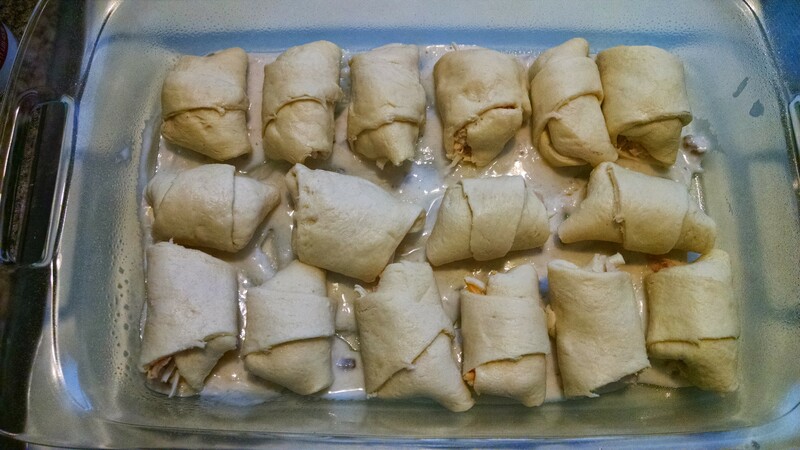 *Continue with the rest of the rolls and filling, lining the parcels up in the pan as you go. 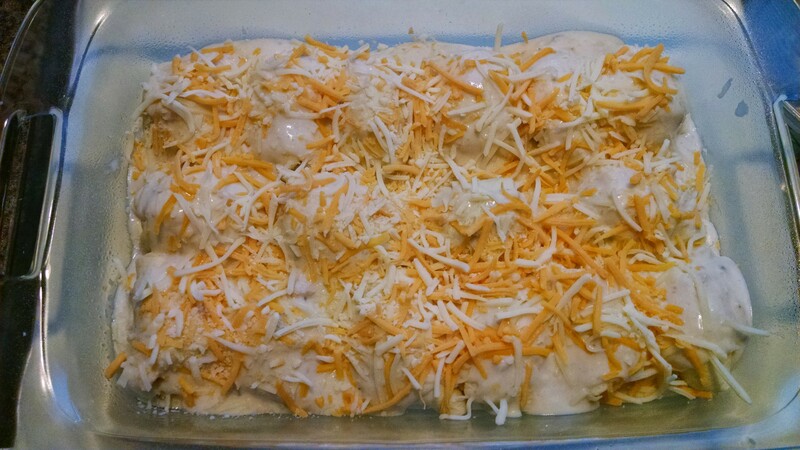 *Once done, cover the parcels with the rest of the sauce, top with the remaining cheese, and cover the dish with aluminum foil that you’ve sprayed with cooking spray (so the cheese doesn’t stick to it). *Bake for about half an hour, remove the foil, and return to the oven for 10-15 minutes; until the rolls are cooked through and the sauce is bubbly. FOUR ingredients. That’s it! Now, you can play around with the flavorings as much as you like. You could use lemon pepper, garlic and herb, ranch, just about anything you can dream up. So play around with it a bit! 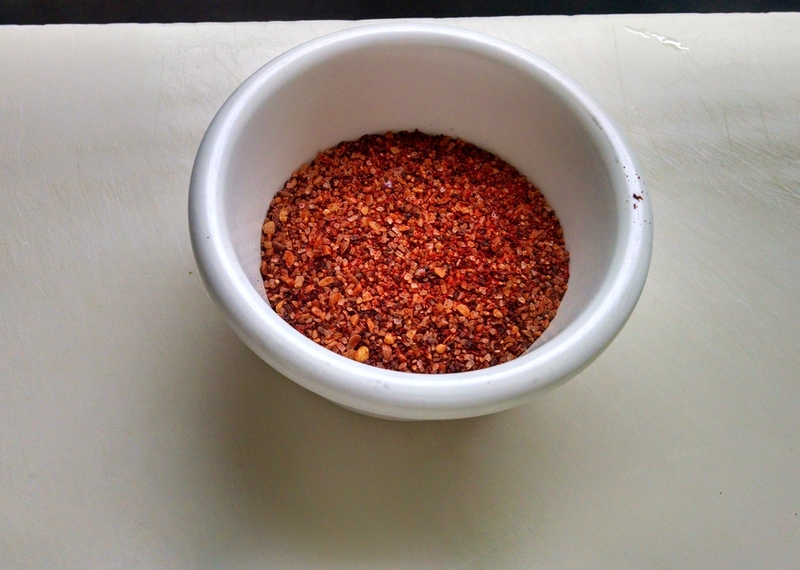 First, mix the steak seasoning and the paprika together. You’ll end up with a pretty fair amount. That’s a full 1/4 cup of seasoning. It’s more than it looks like, really. 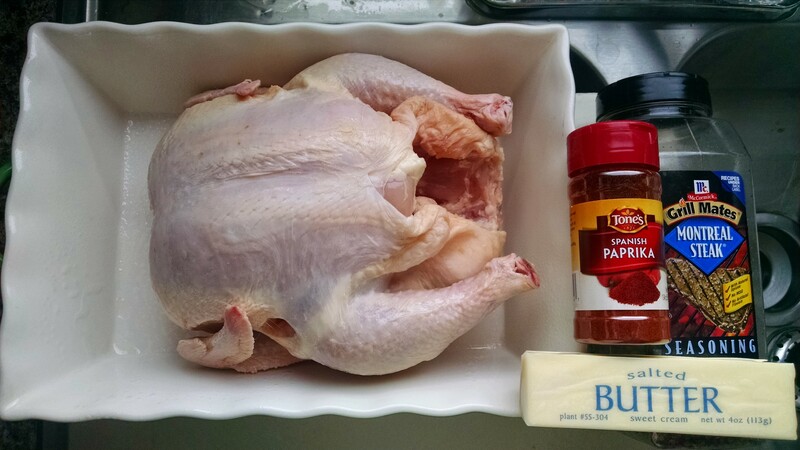 Next, take 1 tablespoon of the seasoning and mix it with the butter. A fork works nicely for the job. Very gently work your finger all the way down the breast. The skin may tear a little, but that happens. Just try to keep that to a minimum. Do this on both sides of the breast. Repeat on the other side and you’re ready for the next step, which is seasoning the rest of the bird. Take about half of the remaining seasoning and sprinkle it all over the inside of the body cavity. That works best if you hold the chicken vertically (sorry I don’t have a picture of that- not enough hands). The rest of the seasoning goes all over the outside of the chicken. I didn’t exactly get it evenly on the outside. Whoops. I’m not perfect. We knew that. Moving on! Put this beautiful bird in the oven and roast it for an hour and a half OR until the temperature in the thickest part of the thigh reads 165-170. Once you reach that temperature, take the chicken out of the oven, tent the pan with foil, and let the whole thing sit for about 20 minutes to rest. Isn’t that pretty! Do you see how the skin split on top? That is why you want to be as gentle as possible when creating the pockets under the skin. 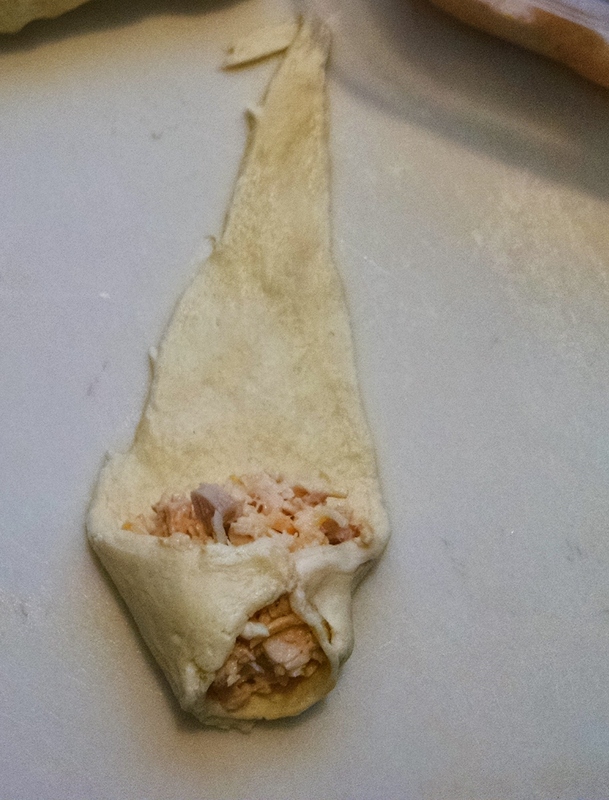 I created a tear (you can see it above) and the skin tightening made the tear much bigger. This chicken is fine- but any bigger a tear would have had bad results for the meat. *Stir 1 T seasoning mixture into the butter. A fork works well for this. 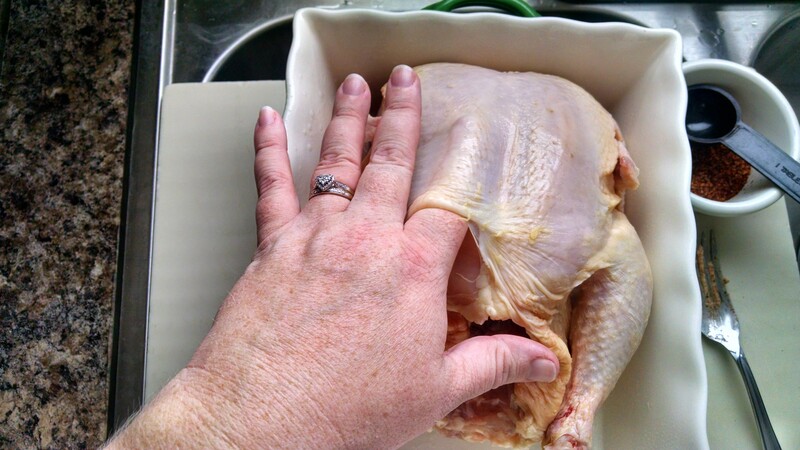 *Create pockets under the skin of the chicken breasts, gently working your index finger under the skin on each side. *Divide the compound butter mixture in half. Form a flattened rectangular shape out of each half and slip one rectangle in each pocket you created. *Carefully massage the outside of the breast skin to spread the butter all the way down each side of the breast. 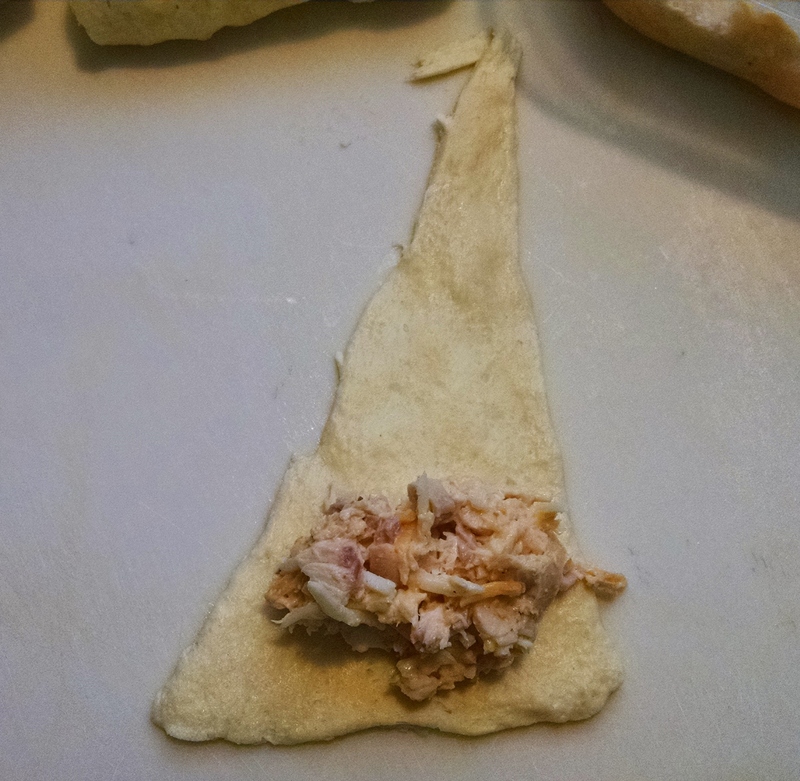 *Turn the chicken so the cavity hole is facing up (the chicken will be vertical) and sprinkle half of the remaining seasoning all over the inside of the chicken. 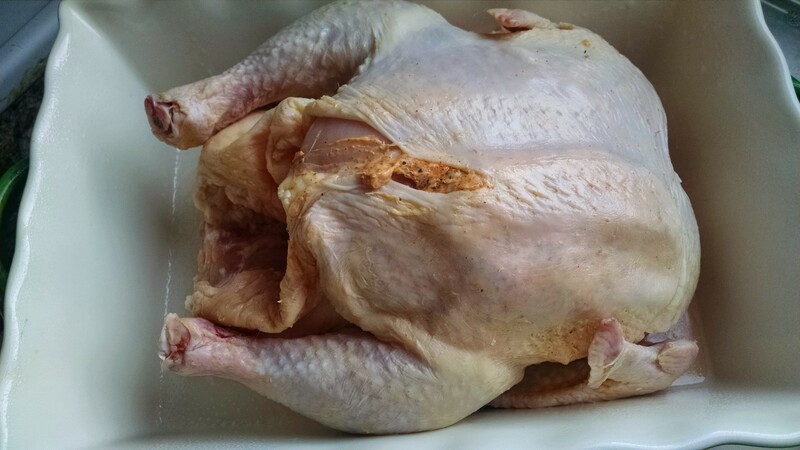 *Lay the chicken down in the roasting dish again, breast side up. 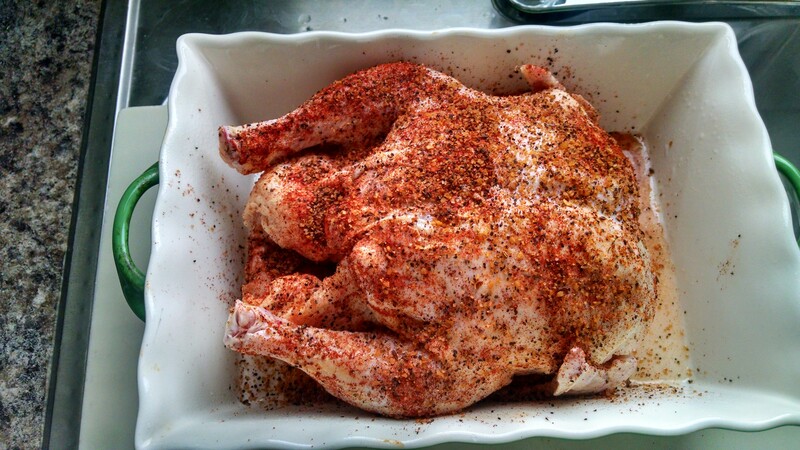 Rub the rest of the seasoning all over the outside of the chicken. 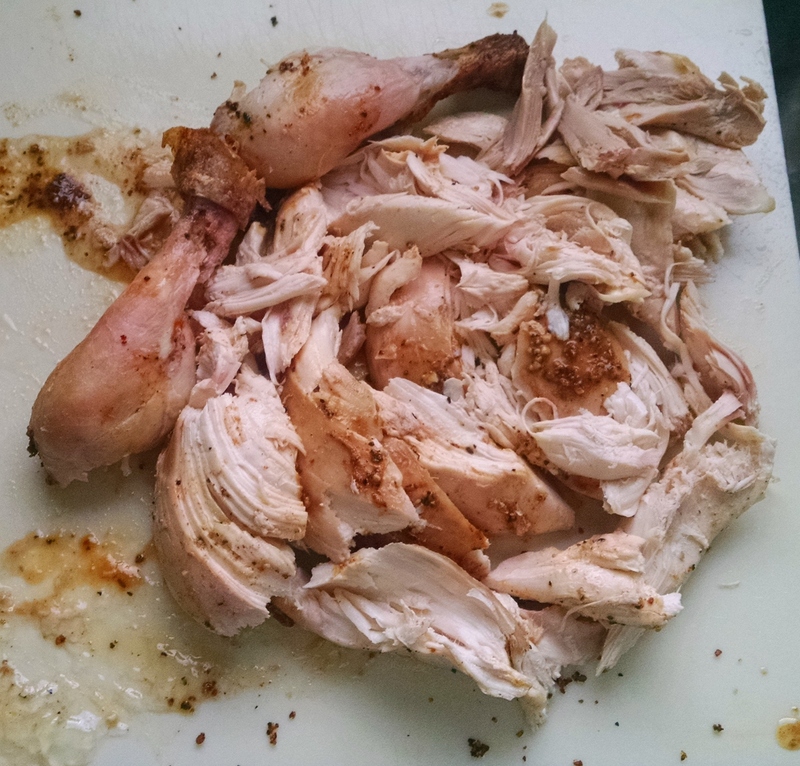 *Roast the chicken until a thermometer stuck in the thickest part of the thigh reads 165-170. It usually takes an hour & a half to an hour & 45 minutes for my oven, but those times vary; the thermometer method is safer than just timing it. *Once that temperature has been reached, remove the chicken from the oven, tent the pan with foil, and let the whole thing rest 15-20 minutes. *If serving as a meal, carve and serve. 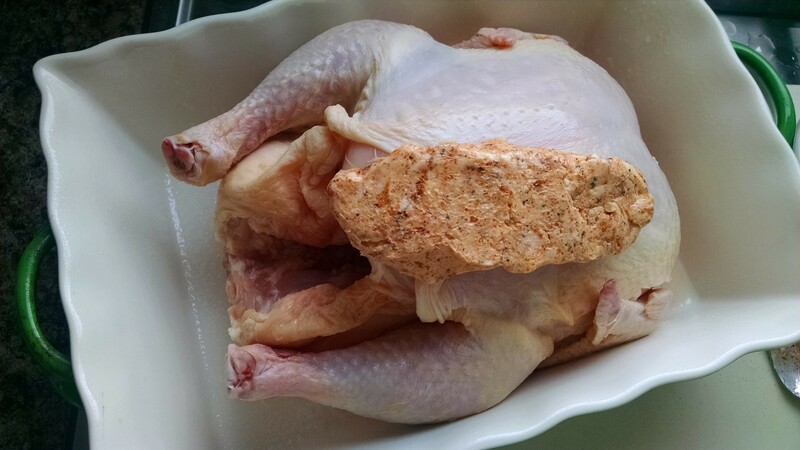 *If using for other dishes, remove the chicken to a platter or large cutting board. Let cool until easily handled, and debone. 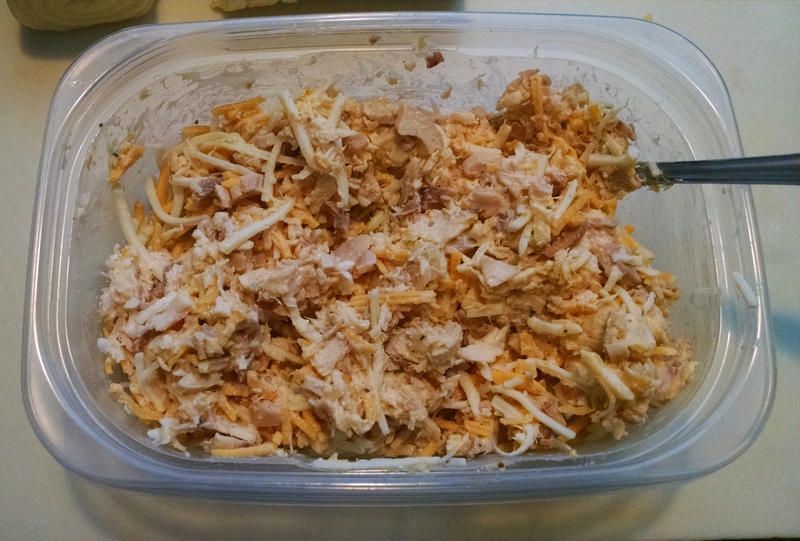 Divide the chicken into proper portions (according to the dishes you plan to use it in), store in freezer appropriate containers (I use plastic and then foil), mark said containers with the date and contents, and freeze. Use as desired. 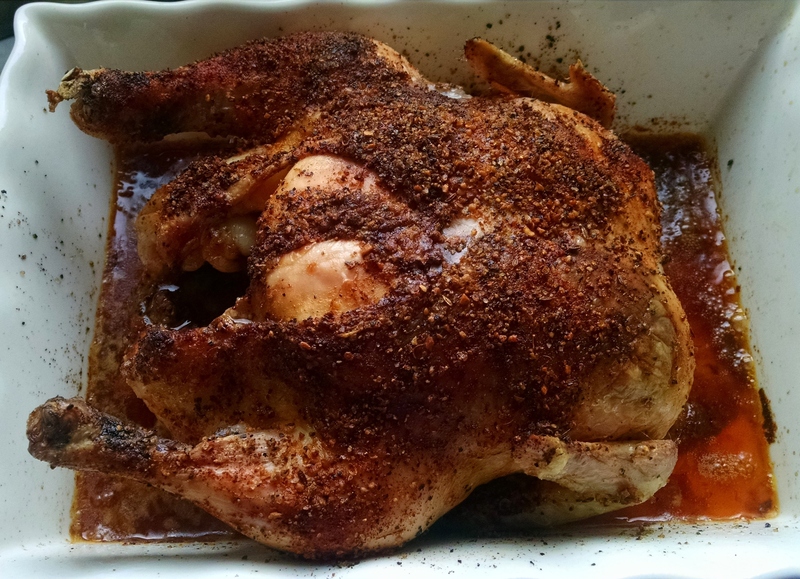 *When using in other dishes, keep in mind that this chicken will add flavor to the dish. You will need to adjust the salt and pepper of the final dish accordingly! *Spray or otherwise lubricate the crock of a large slow cooker (mine is 6.5 quarts and the chicken fits perfectly with no extra room on the sides. A smaller crock would be too small). *Fold an aluminum, disposable pie tin into thirds and place on the bottom of the slow cooker. This is to keep the chicken off of the bottom of the crock. Alternatively, you could make large balls of aluminum foil to put under the chicken. If you have a roasting rack that fits in your crock, that’s fine too. The point is: keep the chicken off of the bottom of the crock for this method! *Place the chicken on the tin (or whatever you used to hold it up), put the lid on the crock, and set the slow cooker to high. *Cook the chicken 4-5 hours, until the temperature reads as stated above. Remember: when you take the lid off of a crock pot you add about 30 minutes to the cooking time. So do this judiciously. *Once cooked, continue as stated for the oven method.